A symbol chart is a visual representation of a crochet pattern. Each row or round is depicted, stitch by stitch, using symbols that represent the stitches. 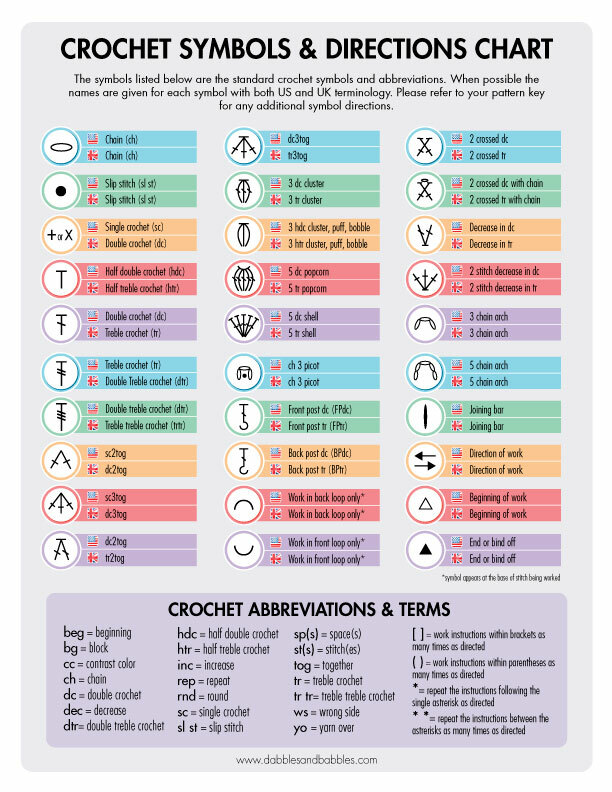 The Craft Yarn Council has adopted a set of standardized crochet symbols, which are generally used across all crochet patterns. The symbols within the chart are designed to look like crude representations of the stitches; once you have gotten used to seeing them they will be as obvious to you as the written crochet abbreviations that you see in patterns. You know that "sc" means single crochet and you will come to know that an x or + symbol also means single crochet. The symbol for the five double crochet shell is shown here in the upper right corner of the stitch. This image also includes the visual design of the stitches as well as the written instructions. Many crafters are visual learners. There are many different ways to learn and a lot of people find image-based instructions simpler to understand than text-based directions. Make the craft easier on yourself if you're a visual learner by learning how to read charts. Charts enhance written instructions. In many cases, a crochet pattern includes both written and symbol instructions. You may generally find it easy to read text directions but in some cases it can be helpful to look at the visual to make sense of specific portions of the pattern. It is extra information that can be useful. Symbol charts aren't language-based. Once you know how to read crochet symbol charts, you'll be able to follow them whenever they are available. This allows you to get crochet books in other languages (Japanese crochet books are popular, for example). You don't have to know how to read the written language if you share the common language of crochet. As we proceed into the details of reading symbol charts, it is important to note that most charts are written for right-handed crocheters. In our Guide to Left-Handed Crochet, we explain that the pattern must be reversed for left-handed crafters. This can be done mentally or through physical reproductions; more details can be found in that complete guide. Once you get familiar with the symbols that represent each stitch, it is fairly easy to read symbol charts. They are designed to read exactly like they look, so the fabric that you are creating in your hands will look just like the visual diagram on the page. There are two key things to learn when reading symbol charts: what the stitch is and where it goes. The symbol looks like the stitch. A chain stitch, for example, is represented by an oval that looks a lot like a chain stitch looks when worked in yarn. A half double crochet stitch is a T shape; an elongated stitch with a bar across the top, which is loosely what that stitch looks like if you look at it in yarn. Multiple vertical lines that come together at a point on top are crochet-together stitches, whereas multiple vertical lines that come out of the same point at the bottom are shell stitches; look closely and you'll see that these look similar to the actual real-life stitches. Post stitches have a "hook" at the bottom representing that you hook it over the post. There are lines to represent "yarn overs". The double crochet stitch looks like the half double T with a single "hatch" line across the bar. This line represents that it has one "yarn over" to make the double crochet. The treble crochet looks similar but with two hatch lines representing the two "yarn overs" that begin this stitch. Brackets are used to indicate stitch pattern repeats. Many designers also include the word "repeat" to indicate the area to repeat and the number of times to do so. Colors are generally indicated by letter. The Colorful Ripple Cowl free crochet pattern includes a symbol chart that shows how each row is a different color, as indicated by letters A-D. Portion of symbol chart for Colorful Ripple Cowl free crochet pattern showing the repeat brackets and the color indicators. The other important thing to know to work from a crochet symbol chart is where to put the stitches. You will work row-by-row or round-by-round as normal, reading images instead of in words. Row-based charts are generally worked from bottom to top, working in the same direction that you always crochet. Round-based symbol charts are worked from the inside out, starting in the center and working counterclockwise (for right-handed crocheters). Most symbol charts have row numbers on the right side of each row. When a pattern is worked in the round, the symbol chart often has an arrow (typically a solid black arrow) to show you where to begin. The stitches in a row go side-by-side (each worked into the next stitch) unless the image tells you otherwise. For example, the symbol for a shell stitch may have five vertical lines coming out of one stitch; you will place all five stitches in the same stitch from the row below. When the stitches are going to be worked in any direction abnormal from the usual, there are typically arrows or other instructions added to the chart to indicate this. Typically stitches are worked through both loops. However, there are exceptions where stitches are worked in the front loop or back loop only. There is a symbol to represent each of these variations: a half circle with the open end facing downwards for back loop or upwards (u-shape) for front loop. It helps to remember that the stitch sits inside a u for front loop, nearest to you, and on top of the hump of an inverted u for back loop, further away from you. The back loop only and front loop only symbols are shown at the base of the stitch where they are worked. So an "x" with a u-shape underneath it represents a single crochet worked in the front loop only. Of course, sometimes you will work around posts instead of into stitches. As mentioned, the post stitch symbol has a hook at the bottom of it indicating this. The hook wraps around the post. Finally, crochet diagrams generally do not indicate whether you work into a stitch or into a chain space between stitches. A common example of where this comes up is in the stitch diagram for a classic granny square, where you would work into the chain spaces; it is only through additional written instructions or your experience with the craft that you would know to work into the chain space instead of directly into the stitch. For that reason, it's important to take a look at the written instructions if they are available. The Pineapple Lace Shawl free crochet pattern by Marly Bird has excellent written instructions along with a clear symbol chart. As you look at this leaf pattern, you notice that there is a set of chain stitches and from your experience with crochet, you know that this is where you begin. So you count the chain symbols and find that there are nine and you may say aloud to yourself, "chain nine". When you get to the end of the chain nine, it will be time to begin your first row (which is indicated by the #1 on the right side of the chart). The first stitch that you see is an "x" symbol, which refers to a single crochet stitch. There is only one of these. As you look more closely, you see that this is worked into the third chain away from the hook (where you made the final chain of the nine chain stitches). So you may say aloud to yourself "single crochet in the third chain from the hook). Next you see that there are two symbols for half double crochet stitches, so you may say aloud, "half double crochet in each of the next two chains). The next three chains each have a double crochet symbol emerging tom them. Say aloud, "double crochet in each of the next three chains". Now look closely at what is happening in the chart. There are eight double crochet symbols in the first chain that you made (which is located at the left of the work). These are all worked into that one stitch and it brings you around to the other side so that you will ultimately be finishing row 1 by working on the opposite side of the foundation chain. For now, say aloud, "eight double crochet in last chain". Turn the work so that you can continue following the chart by working on the opposite side of the foundation chain. You can see that it's a mirror image of the work that you already completed. So you might say aloud, "double crochet in each of next three chains, half double crochet in each of next two chains and single crochet in next chain. This symbol chart should also have a slip stitch symbol, although it does not. You would slip stitch to the first single crochet to close the leaf and then fasten off your work. By working on simple crochet patterns like this one (and the others in the Flowering Necklace pattern), looking closely at the stitches and saying them out loud in a crochet language that already makes sense to you, you should get the hang of reading crochet symbol charts in no time! Remember to check the pattern key for the symbol chart before beginning the work. Although most designers use the standard symbols adopted by the Craft Yarn Council, some patterns may use different stitches so it's always best to double check. Note that most symbols correspond to US crochet terms but some patterns, particularly those written by UK crochet designers, may correspond to UK crochet terms. Dabbles and Babbles has a clear chart showing how the symbols correspond to US vs. UK terms. Practice working from charts that have accompanying written instructions. People who already know how to read instructions can use this as a method of double-checking their work as they learn. Work from the symbol chart but refer back to the written instructions to confirm that you're working correctly. Notice the color of the chart. Oftentimes, a crochet pattern worked in rows will have symbols in one color on right side rows (often black) and in another color (blue or red, usually) for wrong side rows. Knowing this can help you keep track of where you are in the pattern. Alternatively, you may find that a pattern has only numbered the right side rows (those that are worked right to left in a right-handed patter) or that the right side rows are numbered on the right and the wrong side rows on the left. Mark off your rows as you go. Speaking of keeping track of where you are in a pattern, it can be helpful to mark off the rows as you go so you don't lose track of your place in the work. This can be done with marks on the diagram or by using a row counter. You may also want to use stitch markers in the physical work to track your stitches and rows. If you do get lost, look carefully at your fabric and the diagram; they should look the same as one another so sometimes you can find your place visually. Note: although the words are often used interchangeably, there is generally a difference between crochet charts, crochet graphs and crochet diagrams. Charts usually refer to the symbol charts discussed in this article. Graphs usually refer to the block-like visual instructions used in niches like filet crochet and tapestry crochet. Diagrams often refer to assembly / layout instructions. In addition to those patterns linked above, here are some more free patterns that include symbol charts to help you practice this skill.